Are Metal Chopsticks the Best Cutlery for Oriental Dining? Metal chopsticks could just be the best cutlery for oriental dining. 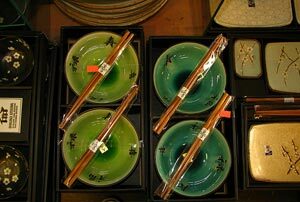 Chopsticks made from metals are becoming more commonplace as a substitute for wooden ones. What has this to do with green living? Are such chopsticks more sustainable and do they make the best cutlery for an authentic oriental dining experience? 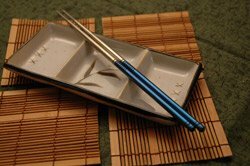 This page looks at some of the best options for chopsticks, including metal chopsticks and the new titanium "Tistix". Thai, Chinese and Japanese foods are now more popular than ever. World-wide travel and international culinary shows have given us all a taste for oriental cuisine - and some of the cultural trappings, such as the use of chopsticks,too. Now an unlikely-sounding environmental threat is becoming apparent, linked to our love of Asian cuisine. Disposable chopsticks are usually used for consuming many oriental foods and, although they are biodegradable, they aren’t exactly environmentally friendly. An unbelievable estimated 25 million trees in China alone are being cut down to supply just chopsticks - 45 billion of them a year. They are often used once and then thrown away. Now the Chinese government China is taxing disposable chopsticks in a bid to cut down waste. Instead, Chinese diners are being encouraged to use metal chopsticks. This will help prevent extensive deforestation in China and the pollution that goes with such industrial-level destruction. Some environmentalists even reckon that chopstick waste is as bad as that posed by plastic bags! Certainly, the problem is a global one as increasingly large numbers of chopsticks are exported from China every year. An incredible 165,000 metric tonnes of chopsticks are used worldwide each year. So what are the best cutlery options for green-loving chop suey* or chow mein eaters - and others who love oriental foods? Here are some of the options. *Chop suey is an American-Chinese dish based on chow mein. - the best cutlery option? Plastic chopsticks might seem like a good idea - but in practice these are not usually highly valued and usually end up in the garbage. They also have a limited lifespan. If they fracture while you are eating with them, they could even prove hazardous. If you try to reuse them, some such chopsticks will not last the pace and will become increasingly brittle with age. Some may be made from low-grade plastics. Metal chopsticks which can be reused over and over again are one answer. Steel chopsticks have been available for a while but they are not perfect. They can be prone to "spotting" and they are quite heavy. Some steel chopsticks may even impart metallic flavours to the food, which no foodie is ever going to tolerate! Titanium chopsticks for green eating? Titanium is now being used to make chopsticks. Metal chopsticks made from titanium do not rust or react to most chemicals. Titanium is inert to the human body and hypoallergenic. It also does not transmit flavours to the food. Titanium is very easy to clean and is therefore ideal for kitchenware. There is a new brand of titanium metal chopsticks, developed by metals artist Alan Folts, who read a query on a blog as to how titanium chopsticks could be made - and accepted the challenge. The resulting product is called "TiStix" and could revolutionise our use of chopsticks. New "TiStix" should, with care last for years, even for generations. And should you want to recover the metal for whatever reason, titanium is highly recyclable. In fact they are made from recycled titanium, so they are making use of a product which might otherwise be wasted. Alan Folt's TiStix look amazing and are available in a selection of colours and styles. Is there a downside? Sure. They might make an excellent wedding present - but the sad fact is they are way too expensive for the suchi bar downtown or the late night Chinese take-away! These are beautiful objects to complement the modern, stylish home. I can't see them as quite replacing the wooden chopsticks of 1,300 million Chinese people just yet! But if you like eating with chopsticks and dislike the throw-away culture of disposable chopsticks, do think about getting some TiStixs. There are also stainless steel metal chopsticks on the market. I've not yet tried them but they have received good reviews at Amazon. Picture: Chopsticks by Brittany G.
Decorated wooden chopsticks can provide a good alternative to throw-away chopsticks. There are many designs available in polished and painted wood which should give good service, as well as being highly attractive. These chopsticks are more durable than the untreated plain wooden chopsticks. It's also worth noting that even ordinary plain wooden chopsticks can be re-used time and time again. Wood has natural anti-bacterial properties and a little hot water and washing up liquid should make them clean and sanitary for re-use. Allow them to dry thoroughly before they are used again. It is perhaps more hygienic to keep your own personal pair, too. Be extra careful if you are re-using chopsticks which have been used with uncooked foods. It's always best to err on the side of caution where raw foods are concerned. I've had some of my wooden chopsticks for years and they come in handy for stirring dishes as well as for dining. The Best Cookware for Green Living is perhaps a wok!